How well do you know the guy next door? Do you understand why he’s always up at night — sometimes all night — yelling and shouting? Is it a fight between brothers, or husband and wife, or father and son? Do you know if they’re simply arguing about what music they plan to play ’til the dawn breaks? Maybe you’re the good natured type and you put a pillow over your head and let it go because you were young once too. Or, maybe you slap on your yodelling CD and let that run at full volume in retaliation. Say you start work at 5 in the morning and you can’t take it anymore and you’re ready to rip their door off the hinges to end the shouting. And if you do rip the door off the hinges, are you justified? Or just deranged? Could be that you know there’s been a problem next door. A fight over custody. Money trouble. Betrayal. Maybe it’s dementia. Bipolar disorder. A bad reaction to meds that generates unnatural aggression. How well do you know the guy next door and do you have the right to judge what he’s done and for what reasons? And right now, just who has the right to decide in such matters is a serious issue for a murder trial underway in a Thunder Bay, ON courtroom. A guy named Andre Wareham has killed another guy in an apartment building. Wareham says it was self-defense. But the trial can’t begin because a judge has ruled the pool of potential jurors doesn’t include enough Aboriginal representation. It’s a shortage that’s been a sensitive matter in other trials in the area. The feeling seems to be that if First Nations people are not part of the jury, the community isn’t being fairly represented. But what’s on trial in a murder case? Is the question truly about who did it? Or is it about whether what was done is truly murder? Is it about coming to some agreement that murder is what the community — fully and appropriately represented — says it is? Or is it about a particular community being supportive of its own because you know the other side is particularly unsupportive? And what does a jury of your peers mean? If I live in Thunder Bay, is it this many Aboriginals and that many non-natives? How does that work in Toronto? Does that change when the defendant is Aboriginal and the victim is not, or the victim is First Nations and the defendant is not? Can any one of us set aside our intuitive beliefs about injustice to pronounce a fair ruling on another? 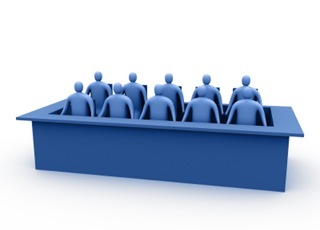 If you were on trial, is there a particular group of jurors you would instinctively be wary of? Would that be a reflection of race, age, gender? These are questions that can see us slide into discrimination territory. The answers suggest we are all inadequate judges. The solution seems to be that, if we share those inadequacies around, we’ll come to some answer that collectively mitigates our respective biases. It doesn’t take into account group think, intimidation, rebelliousness or just plain apathy — all of which can occur when you’re working with a small group of people who have the power to decide the fate of another. I suspect jury trials are all about spreading the responsibility for momentous judgements across the yoke of several backs so no one individual has to bear it alone. In the end, trials make blame-layers of us all. The actions of the judge here seem to be setting a bit of a new precedent in the law in regards to jury selection. That is of course if in fact what he is suggesting is that Aboriginal people should be deliberately selected for the jury. In R. v. Born With A Tooth (1993/Alta QB) the sheriff in charge of compiling the pool of potential jurors to be selected from, deliberately sought out Aboriginal people in the surrounding community to include on the list so that it would be more representative. The crown challenged this process and succeeded in getting a new jury selected because the law stipulates that the pool of potential jurors, which the final jury is then chosen from, must be selected in a random manner. However, it also works the other way. Any efforts to deliberately exclude Aboriginal people or any group is grounds for a new jury to be selected. This comes out of the B.C. Supreme Court decision in R. v. Chipesia where the accused sought for a new jury to be composed because the jury that was selected did not have any jurors of Aboriginal ancestry. Chipesia did not succeed because it was found that there were no efforts to deliberately exclude Aboriginal people from the jury selection process. In the past, the jury selection process has not really evolved to make the jury more representative of the community. Instead it has evolved to put in place measures to prevent jurors who hold a bias (on race, gender, etc) from being part of the jury. This came from another BC case R v. Williams where the accused challenged his conviction on the basis that the jurors were compiled from the community that predominantly held a racist attitude towards Aboriginals. From this case, in the juror selection process, the defence is allowed to ask potential jurors questions to find if that person does or may hold any bias towards a particular group that the accused belongs to. I think the judge here is evolving the law here to essentially support the assertion that a jury that is representative of the community increases the probability of a fair and non biased trial. The use of a jury seems so out of place in our legal system. However, in my opinion, it adds a necessary human component to the trial process. This is not to say judges are inhuman but it can’t be ignored that judges are not representative of many of the communities they serve. At best, judges can strive for unbiased perceptions. Juries too can only strive, if they even choose to, for unbiased judgement. However, a jury can be a better indicator of societal values and community standards. A judge is constrained by the incremental straightjacket, the stagnant “principles of fundamental justice”, and the protection of constitutional values that were undemocratically imposed on the greater society with conflicting values. To serve justice a judge must remove himself from the human emotion and complexity of interrelationships that are at play before him. This objectivity makes the law predictable but it is ultimately less realistic and farther removed from the political, social, economic realities of society. I think fairly arranged and representative juries are better served for the administration of justice as they better espouse the moral compass of a particular community. Values are not universal or static. Current values that direct the administration of justice is representative of the values of only a small, yet powerful, class of individuals. Criminal offences are put forth as crimes against the state or crimes against society. I would have to disagree. Criminal offences should be regarded at most as crimes against a community but more accurately as crimes against an individual in a particular community. Thus, members of that particular community are best suited to determine what is and isn’t a crime. This also allows for the administration of justice to be grounded in more legitimate and representative values. This can be achieved in the current model if juries are arranged so. A jury is strongly encouraged and expected, but not bound by any means, to base their judgements on the law as it is stated in the Criminal Code. Furthermore, a jury does not have to explain the rationale for their decision. So technically, a jury could serve as a mechanism for “community justice” based on community values and not the Criminal Code. It is indeed a contentious and interesting area of the trial process. Put it like this: What happens to an Indigenous person in northern Ontario who refuses jury duty once summoned? I’m no legal expert, but I believe there are fines and/or other legal repercussions. And so, Ontario law now mandates the participation of Indigenous peoples in settler law, becoming “active members of settler society,” despite the fact that settler law has always (and continues to be) inherently biased against Indigenous peoples.